I die a little on the inside every time I see the Josh Smith salary commitment. I know it is very unlikely to change or influence any significant move the team makes or could have made, but it kills me a little nevertheless. Harris was a weird fit in Orlando. I wouldn't fret them getting rid of him. They want to feature guys like Oladipo,Hezonja and Gordon. They also have a few otehrs like Fournier and Frye who play his position. They weren't in a position where it was smart to pay him all that money. Or they know he's an empty stats guy nd we just got boned. We shall see. Jennings is a nice fit there too IMO. as for Morris, I think he is too much of a focal point right now. He's not good enough to succeed with a D keying on him. This move could be huge for him. Hmm, not sure how I feel about this. They need shooting so they trade the better long range shooter for a worse one and Harris never struck me as a defensive stopper plus that's one hefty contract. I'm getting a bit of a Smith vibe tbh although Harris doesn't come with the excess baggage. The upside is that he's young enough to improve but what they are getting today doesn't seem like a big improvement IMO. Seems like he's banking on long term potential here which I suppose is fine because this isn't a present contender. At least SVG is proactive in trying to upgrade the roster so I'll give him that. Oh and is Blake back to being the backup? He wasn't all that bad but how much does he really have left in the tank for a stretch run. 30% and 26% this year from each corner. Del, what is your opinion on the trade? I think the question is going to be, does Morris get to play PF like he wants to now, and we let Harris play the 3? Read an article that stated he was playing better at the 3 than the 4 but it was back in December I think so things have changed. For the record, he definitely had a rough December and January but his November was really good. 35% from 3, 8 rpg, 14 pts. I think the big reason for his decline in scoring is his reduced USG% from 22% to 19%, he's taking 3 fewer shots per game, and playing 3 fewer mpg. I think there's ample reason to think he can rebound from this slump. All that said, as Del commented...gotta wonder how Orlando is so ready to give up on him so soon. I would have to think that the forward matchup on both ends will depend on the individual matchup, rather than really assigning each a permanent SF and PF role. Just a guess. Harris is the better rebounder and shot blocker, so this may be a factor against certain teams/schemes. Harris was never going to be utilized to his potential under Skiles, a coach who ran him out of Milwaukee. Factor in that Orlando favors seeing where things go with Gordon and Mario, and Harris was almost certainly never staying in Orlando. Signing him to the max deal last year, as some pundits pointed out, was merely securing an asset for future considerations. If you ask the average Orlando fan if they feel that Ersan and post-injury Jennings is a fair return for Harris, your answer would certainly be no. I was pretty outspoken about not acquiring Harris last summer as a FA, but swapping him for Ersan and Jennings when we have Morris in the equation is A.O.K. with me. This will cut into Tolliver's minutes, IMO, and give Harris/Morris/SJ close to a true three-forward rotation. It makes the Pistons more athletic, marginally better on defense and it locks in another forward for his prime years. It does take away our best distributor, but I have a feeling SVG may nab a PG before the deadline is up. It's too bad we couldn't talk Orlando out of Napier in this deal, somehow, but I'll take this result all day. The main difference between Smith and Harris is that Harris knows he isn't supposed to dominate the ball. He just shoots it, but not from 20' after dribbling around for eight seconds. Nas, Orlando has really dialed-down Napier's role of late. They may be a good enough defensive team to absorb Jennings, we'll see. I think Harris' presence will take some of the offensive pressure off of KCP and allow him to spend some games putting all his focus on the defensive side. Love this move. Harris is just 23 and can play the 3/4. He's locked up on a decently cheap deal which allows us to avoid the bidding wars this summer. 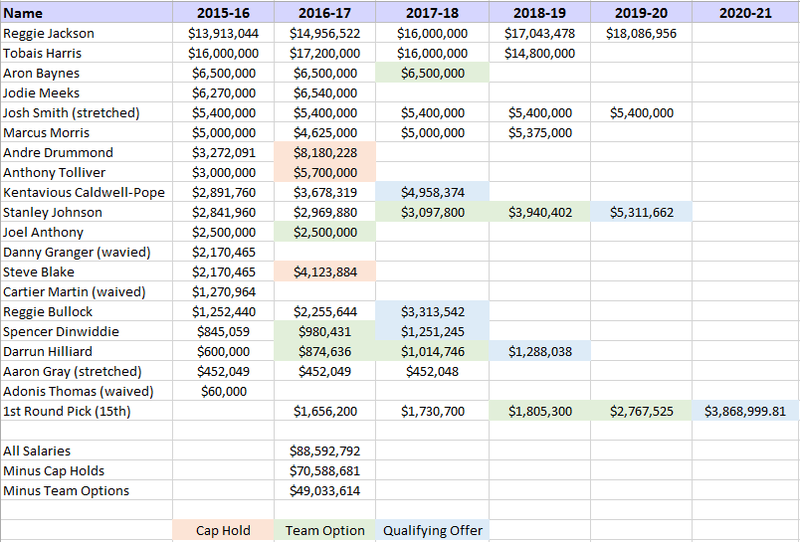 Should provide ample cap space to improve the bench. Our 3 point shooting concerns me though. Hopefully these young guys can improve. ... I was pretty outspoken about not acquiring Harris last summer as a FA, but swapping him for Ersan and Jennings when we have Morris in the equation is A.O.K. with me. This will cut into Tolliver's minutes, IMO, and give Harris/Morris/SJ close to a true three-forward rotation. It makes the Pistons more athletic, marginally better on defense and it locks in another forward for his prime years. It does take away our best distributor, but I have a feeling SVG may nab a PG before the deadline is up. It's too bad we couldn't talk Orlando out of Napier in this deal, somehow, but I'll take this result all day. This is a good summary of Harris and of the trade. From Free Agency last summer to where we are right now. ESPN gave us an A on the trade and Orlando a D.
I would be all up for going after a defense-first PF/Center now. Biyombo/ Noel/ even someone like Amir Johnson (older at 28 but still a decent rim-protector and defender and can actually shoot a bit...). Depending on the player, might cost a 1st (Noel), or expirings, or...? IE: Does this cost us a 1st? Is Boston looking to clear cap space at all, to go after a couple premier players? Will they take our crap in order to move salary? Do they even want to move Amir (I thought I read that they were looking to move him at 1 point...)? .......The 23 year old isn’t a floor-spacer Ilyasova’s caliber, but a far more valuable offensive player nonetheless. One of Detroit’s biggest problems offensively has been a lack of off-dribble verve and overall dynamism after the vaunted Jackson-Drummond high ball screen stalls. That won’t be a problem with the versatile Harris around. He’s an aggressive penetrator against wild close-outs, is growing as a pick-and-roll creator, and it’s fair to assume Van Gundy will take advantage of his unique physical profile when mismatches surface, too. Aerhaps most importantly, Harris is the kind of player who can keep an offense afloat when Jackson and Drummond are forced to the bench – times that proved the Pistons’ chief pre-All-Star undoing. Detroit is better today after this deal, and they’ll be better long-term, too. Harris signed a four-year, $64 million contract with Orlando in July. With Drummond, Jackson, Harris, Kentavious Caldwell-Pope, Marcus Morris, and promising rookie Stanley Johnson around for the long haul, the Pistons suddenly boast one of the league’s most promising, well-rounded young cores – and could even trump the normal timeline for contention once this year’s playoffs finally tip off, too. Solid move. Ersan wasn't playing in the 4th due to his poor defense and although Jennings is a nice story we all wanted to get something for him before he left. Now we're far more versatile defensively and offensively as well. We can switch more easily on defense and we have more options on offense. SVG has done a nice job of gathering a collection of young players and giving up very little. We'll see if he can mix them all together and make it pan out. The question becomes whether or not SVG is comfortable sticking with Blake/Dinwiddie or if there's another small move coming to get a backup PG. Well, I think this was a pretty solid to super move. Trading two expirings for a young guy with upside who is locked up. Tobias Harris is good, Skiles didn't like him, we should get Tobias Harris from last year, a young rising star. He could be a nice complement to Drummond, take some of the offensive load off, he's got some post moves. Maybe SVG pulls the trigger on another deal that improves our PG situation this year, and also going forward. Might be hard to do both, so we'll see. I think we need a defensive front-court player, with the Forwards that we have. Just someone to go out there and play tough D, protect the rim, absorb fouls... as needed. This makes sense, getting Harris while he's signed for a few years. I don't know much about him but it seemed like a lot to be giving up. It was smart to pay it forward and acquire the PF now as opposed to getting into the bidding wars over the summer and potentially walking out empty handed. Harris will be 23 next season. This team's core is crazy young. I just happy to have a little more intrigue to the season now. After a great start, this team has been a lull for two months. Maybe Harris can spark us. You're the only person who has given this anything less than an A grade. Maybe that should be a big clue.